In today’s world, finding first hand and second hand copy products is very easy. These products look so authentic that one can often not tell the difference between a genuine. 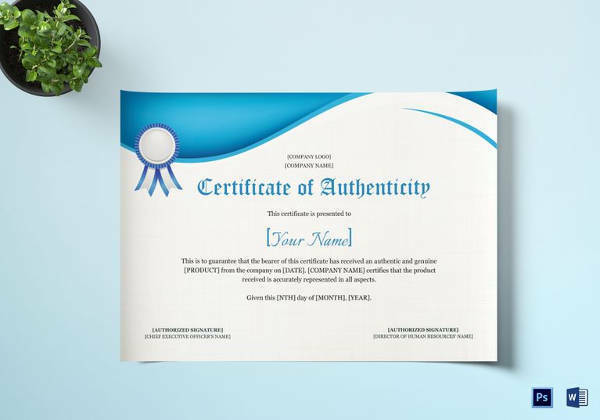 In order to provide evidence to your customers that all your products are authentic we have created the perfect Certificate of Authenticity Templates. Our free and downloadable example Certificate templates come in a variety of formats with the option to add in details like the weight of the product, the date of manufacturing of the product and other relevant information. Select and print the sample of your choice with the necessary information and hand it over to your customer at the time of sale. 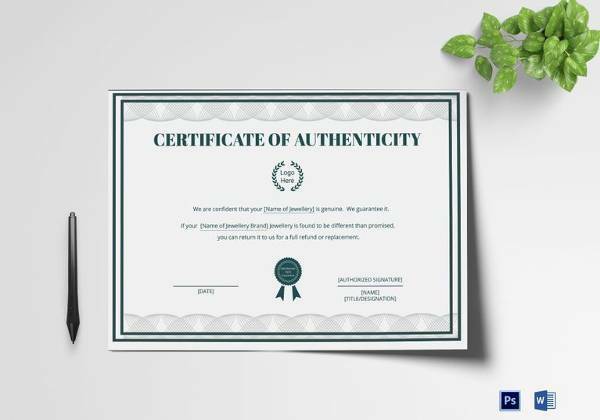 The certificate of authenticity sample template can be downloaded easily for use. Details like artist’s name and address of gallery can be edited. It has designated spaces for particulars like title, year painted, size, medium and material to provide the prominent details. 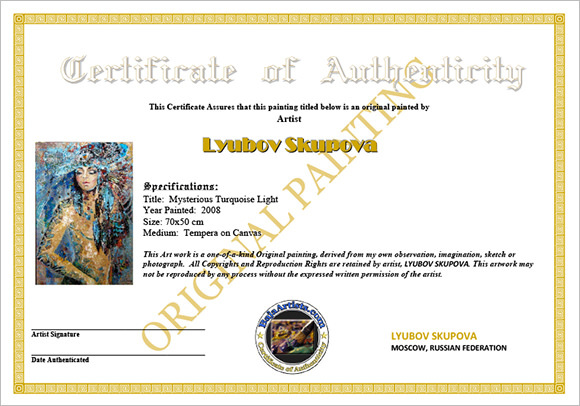 There’s also space for artist’s signature and date authenticated which proves the authenticity. 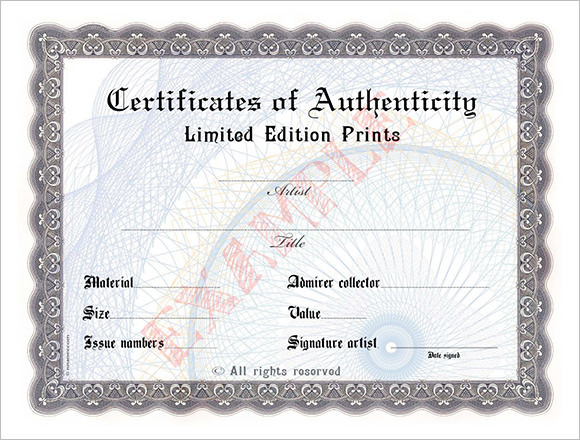 The blank certificate of authenticity template is the certificate of authenticity for limited edition prints. It features the name of the artist and title. It also has designated spaces for details like material, size, issue numbers, admirer collector, value and signature artist. 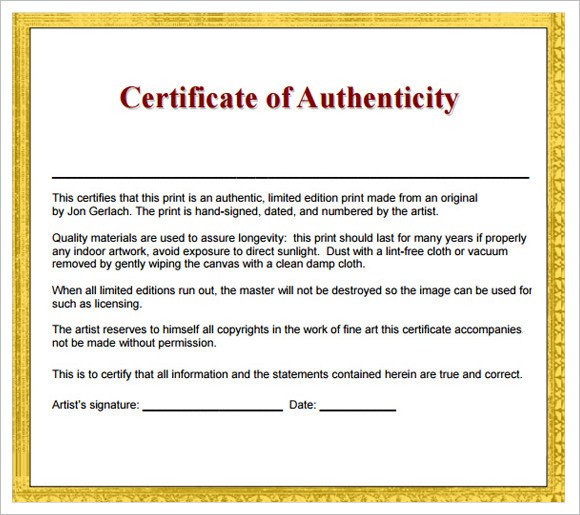 The download certificate of authenticity template is the template which provides all the content to be written already present in it. It has designated spaces for artist’s signature and date. This template is the moist basic and ready to use template. 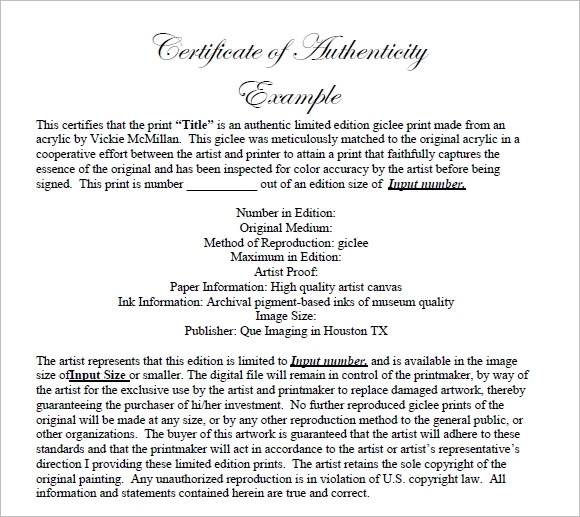 The fine art certificate of authenticity template features all the required details like artist, date of release, title, image size, number edition, paper, artist proofs, medium and roman numerals. It also has designated spaces for the name of print service/ artist and publisher. 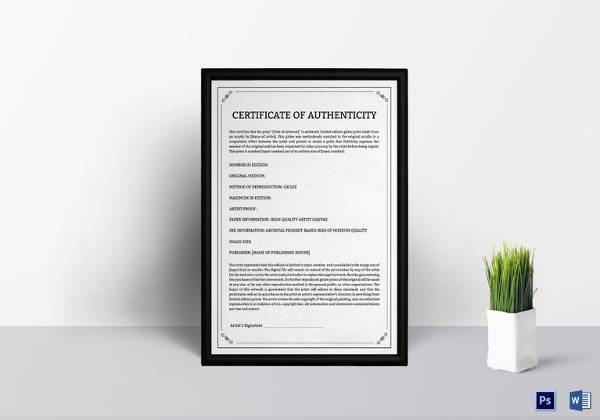 Why Does The Certificate Of Authenticity Template Needed? 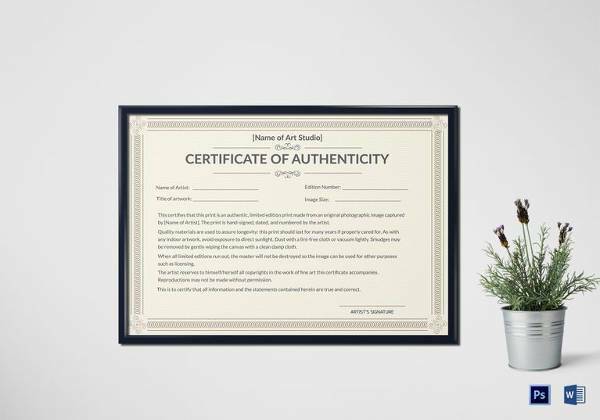 The certificate of authenticity template is needed to create the authenticity certificate as the proof of authenticity of the product. There are many products available in the market which looks like the real product in their appearance but are not the real ones. 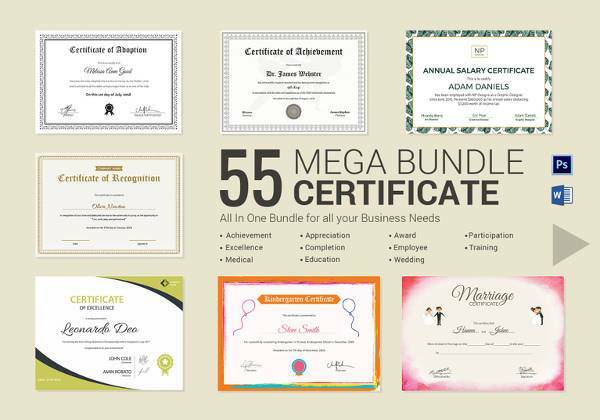 These Certificate Templates help the owner or seller of the product to prove the product’s genuineness. There are many designs of the template to suit the requirements of the owner. Also, the templates are user friendly and can easily be downloaded. All the details are already mentioned in the template and only spaces are to be filled. 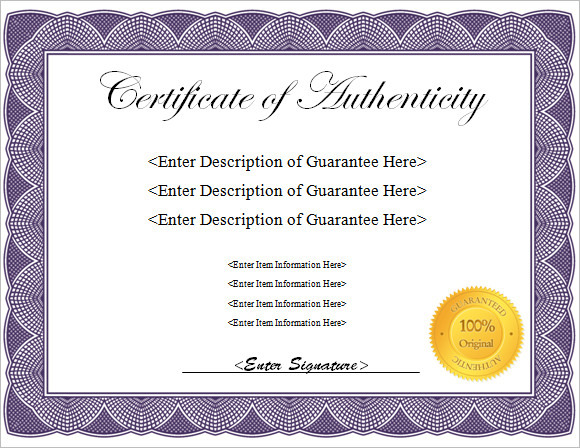 When Does The Certificate Of Authenticity Template Needed? 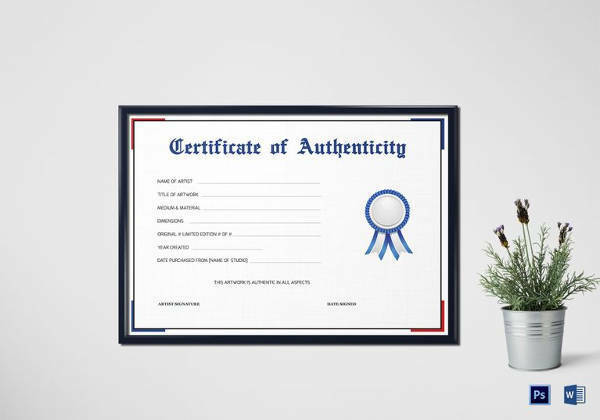 The certificate of authenticity template is needed at the time of making the certificate of authenticity. 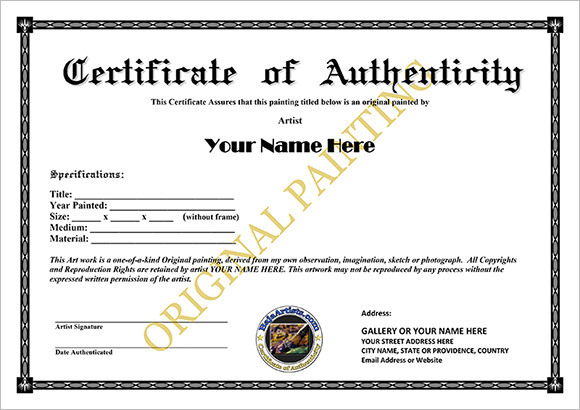 The certificate of authenticity is needed by the owner to prove the genuineness of the product or an item. These templates make the work of the owner/ seller very easy by providing them the format of certificate. Also, the details present in the certificate can be edited. There are different templates for different needs of the issuer of the certificate. 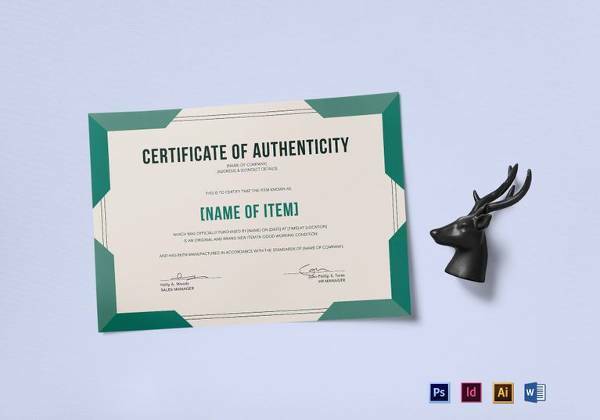 This Certificate Templates is very important to issue with the product so as to avoid any confusions or doubts in the future. 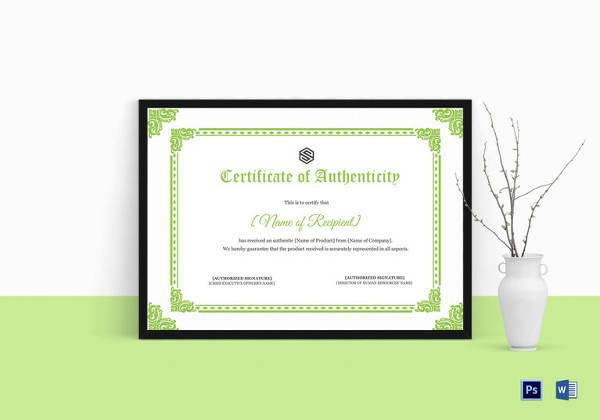 One of the biggest benefits of the certificate of authenticity is that it proves the genuineness of the product. The certificate issuers as well as the buyer both are satisfied and can avoid the future conflicts about the authenticity of the product. 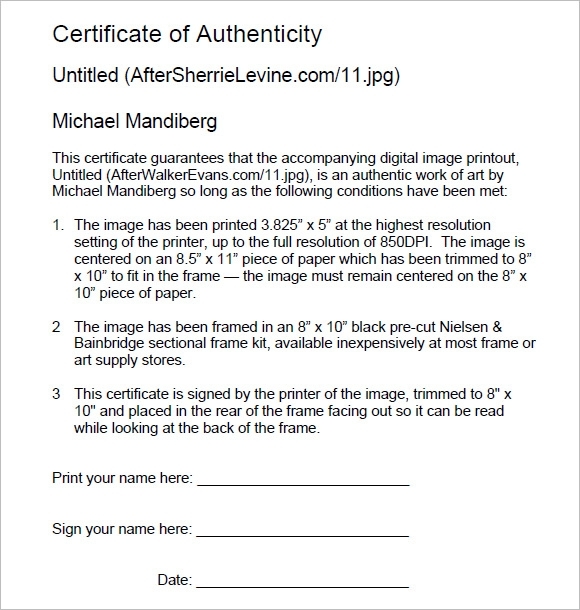 These templates features all the details which are required to be presented on the certificate like the artist or issuer name, date of authenticity and signature of the artist. The issuer can choose out of several template designs, the one which he/she desires and has all the details he wishes to write. The certificate of authenticity is very prominent nowadays as there are several copied products in the market. This template makes the work of certificate issuer really easy by providing the readymade layout which can be directly used after printing. Also, it avoids any future conflicts between the buyer and seller about the authenticity of the product.